Cryotherapy is a technique that uses an extremely cold gas to freeze and destroy abnormal skin cells that require removal. This technique has been in use since the turn of the century. 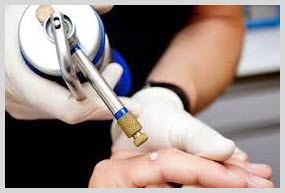 Cryotherapy can be employed to destroy a variety of benign skin growths, such as warts and skin tags. The goal of Cryotherapy is to freeze and destroy targeted skin growths while preserving the surrounding skin from injury. Cryotherapy does not require anesthetic, is risk free and can be administered to patients who are not necessarily suitable candidates for surgical procedures. Short term pigment changes which should return to normal in a few months. Short term nerve damage (areas where nerves lie close to the skins surface, fingers, wrist area, behind the ear cab be affected). Normal sensitivity should return in a few months. You will feel a stinging sensation during the treatment and possibly afterwards but this will shortly pass.